Disadvantages: Some combination of features from different factories; no etched brass. 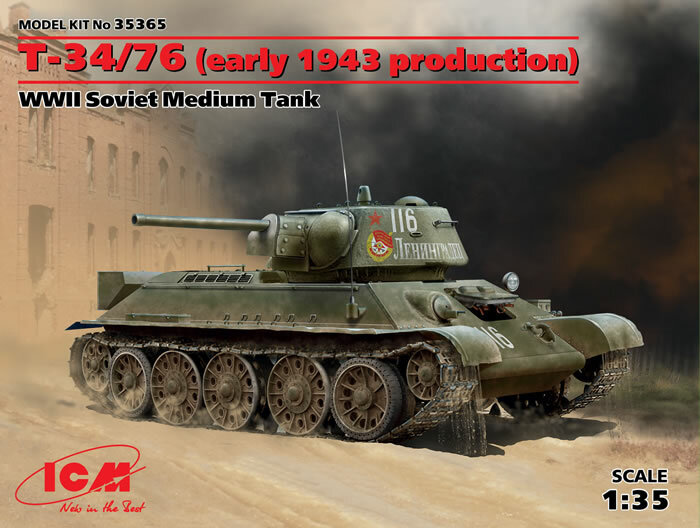 Recommendation: Highly Recommended for all Soviet T-34 fans and modelers seeking a “weekend” build. There has been a trend of late among many modelers away from the hyper-detailed kits that are now common and back towards simpler times when models could be put together in a reasonably short period of time. 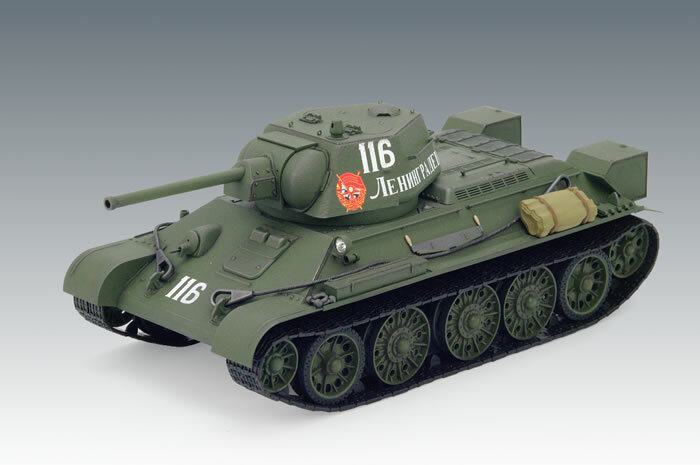 This is the second T-34 kit in recent months that leans towards that aspect (the Academy T-34-85 was first) and shows that it may be an idea many will appreciate. ICM has made great strides as a manufacturer and this kit is an example of their recent efforts. It is cleanly molded with a slide-molded full lower hull pan, full molded upper hull and turret shell, and nicely done parts with a minimum of ejector pin marks (where present they are inside where they do not show). It comes with a complete set of wheels for either the early 1943 production when Glavtank ordered that road wheels on stations 1 and 5 be fitted with rubber tired wheels to help limit noise and fatigue-inducing vibration that affected crew performance, or a full set of late 1943 rubber tired cast wheels. There is a partial interior consisting of seats for the driver and bow gunner as well as the main gun and its fittings to include the coaxial DT machine gun. External components include a set of pioneer tools, spare tracks, ice cleats and a rolled tarp of four parts (front back and ends with the proper depiction of the layers of the roll). But as noted (and as can be seen from the parts count) this is a simplified kit. It comes with what appear to be regular vinyl tracks in two sections per run; these are usefully flexible (no SKIF super spongy types) but will need ACC to get them to fit in proper form to the tops of the road wheels. Vinyl tow cables are also part of the kit. The engine deck comes with all four louvers as part of the kit, but while the top and side intake grilles are nicely molded as open the radiator exhaust grille is one solid piece. ICM did not provide for a way to cut it out so the modeler is on his own and if desired will have to look for an after-market mesh grille and cut it out the hard way. Most of the features match to a standard production Factory No. 183 late 1942-very early 1943 production with handrails fitted and as noted it does offer the full set of five rubber tired road wheels for the model. 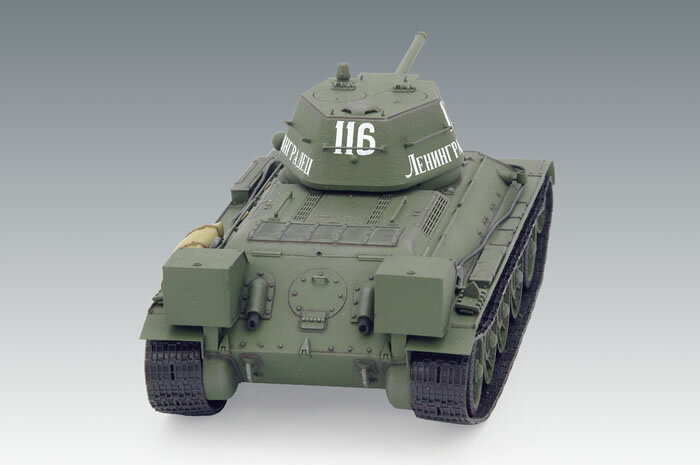 Six different finishing options are offered: 1st Red Banner Tank Brigade, Leningrad Front, summer 1944 (4BO green, Red Banner markings, white 116 “Leningradets”); 1st Red Banner Tank Brigade, Leningrad Front, winter 1943-44 (whitewash, Red Banner, red 116 “Leningradets”); “Revolutionary Mongolia” tank column, winter 1943-44 (whitewash, red markings for “Revolutionary Mongolia” and “Marshal Choybalsan”); “North Sea Komsomolets” tank column, winter 1943-44 (whitewash, red markings for “North Sea Komsomolets”); Unidentified Unit, Stalingrad Front winter 1942-43 (4BO, white E 527); 5th Guards Tank Corps, Kursk bulge, June 1943 (4BO, white 52-02). A colorful sheet of decals is provided for these markings. Overall this is a very neat and simple kit that will yield a good representation of its subject. A set of after-market etch will bring it up to speed along with a set of individual link tracks, so even the detail fans can built a nice model from the kit.